—Take some pork rind, remove the fat, scrape the outside quite clean, and put into a stewpan, and pour enough warm water over to cover the skin. Let it get quite hot, and stir the skin round in the hot water with a wooden spoon until it becomes quite thick-looking. Now pour the thick-looking water off, and pour some more water on to make the skin quite clear, then put in a little more hot water. To 3 pints of water take 1 lb. rind or 1½ lbs. cooked calves' feet. So that the jelly may be stronger and more tastv, let there be a pound of lean meat. 1¼ oz. salt, two lemon rinds, eight whole peppercorns, two cloves stuck in an onion, one carrot, half celery slick, one glass fine vinegar. Put these all in the stewpan beside the meat and water, and stew until the skin is perfectly tender. Let the mass cool, and take all pieces of fat away which have gathered on the top. To clear, put the jelly again on the fire, but let it only get lukewarm. Have the whites of three eggs well beaten, add them with their shells to the jelly, and stir gently. When it comes to the boil, draw the saucepan to the side of the fire, put on the lid, and let it gently simmer for half-an-hour. Pour now through a straining cloth and then through filtering paper into a china dish. Do not put it into the mould until it is lukewarm. Before putting the jelly into the mould, it should be coloured, if desired, with vegetable colours in carmine, violet and orange. It should then be allowed to remain in the shape until perfectly cold. Before turning it out, hold the shape up to the brim in water (which is pretty warm, but not so hot as not to bear the hand in it) for some seconds. The jelly can then be turned out on a dish of the shape, but the shape should be again gently put over it to keep it from being damaged. The copper saucepan used for making the jelly should have a strong bottom. Paris Meat Supply.—See Meat Supply (Paris). Parisian Pork Sausage.—(German Becipe-).—For 20 lbs. take one-third beef and two-thirds pork, either fore-leg or hind-leg, 12 oz. fine salt, 1 oz. pure cane sugar, ½ oz. pulverised saltpetre. Chop the pork up coarsely, and mix in among it two-thirds of the salt, saltpetre, and sugar. Then cut up the meat and put the other third of the salts amongst it. Then let both meats stand by themselves until red. In summer twelve hours in a cool room is sufficient; in winter they should remain two to three days in a room warmed to about 72º Fahr. Then first take the meat (the beef), chop it fine, then add coarsely chopped pork, also 1 oz. Ground white pepper 1/3 oz. fine ginger, 1/3 oz. Mace, 1/3 oz. Allspice, 2 eschalots (grated and salted). in the preparation of it. Paste Cutters.—see Pork Pie Making. Paste Rollers.—see Pork Pie Making. Season to taste with white pepper and grated nutmeg. Mix well, put into skins, and boil in an enamelled pot. Pearl Ashes were originally derived from the ashes left on burning wood, especially twigs and leaves. The ashes were lixiviated with water and the solution evaporated to dryness, the residue so obtained forming the pearl ashes of commerce. Latterly the salt has been made chiefly from kelp (burnt sea weed) or from kainit, a mixture of salts of potash, soda, magnesia and lime, which occurs in large deposits in certain parts of Germany. Pearl ashes consist essentially of carbonate of potash and the compound is strongly alkaline and detergent. In the food trades it is used principally in cleansing and bleaching sausage skins and bladders. Pepper.—Probably no spice is of so much service as pepper. It is certainly the most popular of all spices. The pepper vine is a native of Malabar and Travancore, but is now pretty generally cultivated all over the East. The favourite qualities come chiefly from Singapore, while shipments are also largely derived from Penang, Tellicherry, Sumatra, Trang, Siam, and Cochin. The plant requires to be supported by trees, posts, or other supports. It is propagated by simply planting cuttings or suckers before the commencement of the rains in June, in a rich and tolerably moist soil. The vines bear fruit in three years and continue bearing for ten or twelve years. The crop is gathered in March or April; the spike shaped clusters being plucked and dried on mats in the sun. White pepper differs from black only in being deprived of the outer skin, and this is accomplished by macerating the berries in water and then gently rubbing the skin off. A good deal is lost in taking off the skin, as the peculiarly agreeable aromatic flavour of ground black pepper is derived largely from the skin. The pepper vine grows to a height of twenty to thirty feet, but for the sake of convenience in harvesting it is usually kept very low. Used in moderation pepper assists digestion and is most wholesome and stimulating to the stomach. Many natives in India drink a strong infusion of pepper as a stomachic or appetiser, and in some districts a fiery spirit is made from the berries which is used for the same purpose. Pepper Grinding Mills.—In the large pepper grinding factories, stone mills are used for the purpose as these make by far the best grist, but where users wish to grind their own pepper and so obtain the benefit of the fine aroma which can only be had from freshly ground corns, steel mills with specially hardened grinding plates are commonly used. The steel plates are circular and have the faces grooved to a particular skew so as to make an efficient grinder. 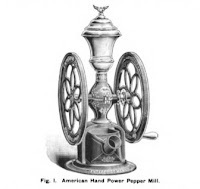 These mills may be had in different sizes both for hand and power. The American hand-power machines are useful where a small quantity of pepper only is required to be ground at one time, but where moderate quantities are required at a time, it is better to have a power driven machine. This may beeffected by either adopting a mill with electric motor combined, or connecting the mill to existing power by means of a belt. Boil for five minutes, let it cool, put through a sieve, and throw away the refuse. This brine will keep all summer, and can be used for every kind of meat. Of course, every kind of meat must be thoroughly rubbed with fine salt before being put in the pickle. Everything so pickled has a fine red colour and a pleasant taste. Pickled Pork.—For 80 lbs. of meat, use two quarts and one pint of fine salt, four pounds of sugar or one quart best molasses, three ounces saltpetre, pulverise and mix the seasoning with the exception of the two quarts of salt, using the one pint only. Kub the meat well all over and lay upon boards in the cellar for 24 hours, then put a few clean stones in the bottom of barrel, lay sticks across these that the meat may not soak in the liquor that drains from it. Pack the meat in layers, strewing between these the remaining two quarts of salt. Let it lie in the cask for 15 or 16 days, every day during this time tipping the cask to drain off the liquor, or drawing it through a bung-hole near the bottom. Pour this back in cupfuls over the meat. Take it out at the end of a fortnight, rub each piece well over with dry salt and return it to the barrel. If the liquor does not cover it, make fresh brine in the proportion of 2 lbs. Salt, ¼ oz. saltpetre, and 1 quart water, and pour in when cool after it has boiled for half-an-hour. Lay a round piece of board upon the upper layer and keep this down with weights. The pork should be put into the brine with the rind upwards. In this position it does not get oversalted. Examine from time to time to be sure the meat is keeping well. Should it seem likely to taint, throw away the pickle, rub each piece over with dry salt and pack anew. Pork pickled in this way will keep two years. important in the curing of meats as pumping. The object of it is easily understood. Meat is liable to very speedy decomposition unless it is immediately brought in contact with a preservative of some kind, such as salt, borax, etc. In ordinary course, if any of these preservatives were laid on the exposed surface of the meat they would mingle with the meat juices, become dissolved, and percolate slowly through the tissues. Put this process is slow and under many conditions of temperature, dangerous. Hence the necessity of an appliance which brings the preservatives at once into operation. The salt pickle or brine, made from recognised recipes, is filtered or syphoned so that it runs clear, and is then injected into the meat to be cured. Pickling Beef and Hams.—(American Recipe).—To 100 lbs. of beef or ham, use 7 lbs. rock salt, 5 lbs. Brown sugar, 2 ozs. Saltpetre, ½ oz. saleratus*. Mix together and boil in 4 gallons of water. Skim while boiling and pour on to the meat hot. For hams to cure well, they should remain in the pickle six weeks. *A mixture of potassium and/or sodium bicarbonate. Pig Casings.—The small intestines of the pig. To be good and serviceable they should be well cleaned, of good fair colour, well salted and of medium width. The medium width are what are known as selected casings and come from medium sized pigs. The best casings are those that have been kept for from four to six months and thus have had an opportunity to become tough and well salted. Medium skins should make up to about 40 lbs. sausages to 1 lb. of casings. Unselected and other casings unsuitable for sausage making are spun into bands and other strings for a variety of purposes (see also Sheep Casings). Pig Curiosities.—Some years ago a curiosity in the shape of a tree climbing pig was shot by a Mr Le Mortemore on Tinana Creek, Queensland. For a number of years the wild pigs had been numerous in his locality and his theory was that the original or common pig, must have amalgamated to a certain extent with some aboriginal animal, or that the necessities of climate, etc., had caused the variety. The captured animal weighed about 1 cwt, and was pretty fat, with bristly brown fur, small black spots, snout and ears like a pig, but the jaw was furnished with front teeth like a rodent; it had large canines and powerful back grinders. The forefeet were furnished with hook-like claws; the hind ones had two hook claws on each hoof. The tail was thick, about a foot long, highly prehensile, and in a state of rest was usually carried in what is known as a Flemish coil. The animal was also furnished with a pouch, which it only appeared to use for carrying a supply of food in while it was travelling to fresh pastures. It is quite possible that this variety was due to the breeding of the common pig with the Queensland tree-climbing kangaroo. Wild Boars in France.—A popular delusion exists that the wild boars to be found in certain French forests are very ferocious, and attack men and other animals with fury whenever they come in contact with them. From a statement in a French paper we find this is not so, that they avoid attack as much as possible, and only when brought to bay at the last extremity use their ferocious tusks in self-defence, fighting for life with much tenacity. It appears that large numbers of these animals are hunted in the forests surrounding Paris, and within a radius of 12 miles of the city, and the slaughter is considerable. They are a long-lived porcine race, for if left alone they last till about thirty years of age, and as they breed in litters of six to eight each time, the multiplication of the species is very considerable, rendering boar-hunting a necessity for the purpose of keeping down surplus population. Sicilian Pigs.—-One of the British consul's reports from Palermo contains some curious details respecting the breeding of pigs in Sicily, which in certain districts, and especially in mountainous parts, are reared in great numbers. Nearly all the small towns are overrun with them, and they are not only useful for food, but act as scavengers to the dirty streets. They are enticed, in towns, to devour the filthiest food by sprinkling bran over it. In the mountainous districts, where there are oak forests, they are driven up to the high regions to feed on acorns. A good acorn year is a godsend to those who possess oak forest. For each full-grown pig as much as 10s. is paid for the acorn season to the owner of the forest; two medium-sized pigs and three small ones are admitted at the same rate. The pigs, which are thus driven about under the superintendence of boy swine-herds, are all ear-marked, and speedily become accustomed to their new conditions of life. They form among themselves a sort of Republican government, and are docile to the calls and windings of the horn of their young guardians, who are clothed in very plain and primitive fashion, and live simply on bread and water, taking out with them every day loaves baked in the ovens of the farm, and in shape precisely the same as those that have been found in the baker's shops at Pompeii. The pigs are driven back home at night and housed to avoid disease, and, strange to say, their sheds are scrupulously clean. It is said that they establish internally a kind of sanitary jurisdiction, and that a pig which is found a delinquent against the sanitary rules, is attacked with fury by the rest and killed. The Consul has seen covered pig sties made of stone, and capable of holding 300 or 400 pigs, and found them dry and clean and quite dusty. The only value of the pigs consists in their being sold as fresh pork and for the making of sausages. They fatten well upon acorns, and their flesh is very white and tasteful, whereas the colour of the pork in the towns is quite dark. The sausages which are made are also very tolerable, but the curing of pork for ham or bacon is unknown in Sicily. Pigs in Sicily enjoy as much social distinction as in Ireland; they, with the poultry and other animals, share their master's tenement, and will trot after him daily to and fro on his way to his work in the fields. Perhaps pork is more commonly eaten than any other kind of meat in the islands. The boy swineherds and goatherds who tend the flocks in the mountains receive their daily provision of bread cooked in the farm buildings, and get nothing else in winter or summer, not even the severest weather, and never, as a rule, even taste "pasta" or macaroni. Besides the daily provision of bread they receive a dole of 75f. * a year, paid in three parts, out of which they find their clothes. A great part of the year the lads sleep in the open air or in the temporary straw huts, often in rainy or snowy weather; and with such a hard life, and nothing but coarse bread and water from year's end to year's end, their cheerfulness and good humour appear quite marvellous; many of them are bright, intelligent, lively lads, and graceful and courteous in their demeanour. Pig's Foot Cleaning and Cooking.—The handling of pig's feet so as to produce a profitable return requires scientific method and absolute cleanliness. The feet should be used fresh as cut from the pig; the front feet are always used first as they are the best for turning into edible delicacies, and the hind feet contain more bone. The toes are pulled off, and the hair clean shaved; the feet should then be well washed and scraped, taking care not to cut them as this causes them to break when cooking. In large factories the cleaning is done by an ingenious machine known as Archdeacon's Pig Foot Cleaner, and after cleaning, fresh water should be kept running on them until they are cooked. The constantly changing of the water removes the blood and makes them more inviting and whiter when cooked. In cooking pig's feet a wooden vat is preferable, which must always be kept scrupulously clean ; at the bottom of this vat a steam coil is fixed, and on top of same should be fixed a perforated hard wood false bottom. It is absolutely necessary to cook pig's feet slowly and to handle them with care. Fill the vat half full of cold water, then put in the feet to within a foot of the water level, or about 18 inches from top of vat, and turn the steam on gradually. After the steam has been turned on for about ten minutes the thermometer should register 70° Fahr., in ten minutes more 80°, and it should be kept heating gradually until it reaches 210°, after which the steam must be reduced so that no higher temperature is registered. In eighty minutes shut off the steam entirely, skim the surface of water, and then cover the vat and let it stand for six hours. The whole should be cooled down by running cold water through the pipes, and the grease can then be taken off in a clean mass—the process of cooling may be continued during the night so that on the following morning everything is quite cold. Take the feet out very carefully so as not to lacerate them. Before using the boned feet have them examined carefully so that they will be entirely free from bone and hair and well drained ; if there are any dark pieces in (as there are sometimes) take them out. Formula.—Take fifty pounds boneless pig's feet, one quart spiced liquor, one quart forty-five grain vinegar, and about two tablespoonfuls of salt; place them in a jacket or other kettle (not iron); a tin or tinned kettle is the best, as vinegar in a iron kettle will turn the meat dark; heat it gradually, and stir slowly; the glutin in the feet will mix with the other liquids and will thicken the whole mass. When it seems thoroughly heated and reaching the boiling point, pour it in gallon-size earthen milk crocks or other suitable vessels as desired. Care must be taken that it is thick enough to become solid when cool; if it is found not so, boil a little longer and add a little more boned meat and try it again. It may take several experiments to get the proper thickness. If you find there is not jelly enough without cooking the boneless feet too much (for it must be cooked very little or it will become mushy), make some jelly out of some forefeet, using very little water and boil slowly until thick enough. The longer you boil it the thicker it will be until the meat is all boiled away; or you can add a little more of the drained boneless feet until it is thick enough. Be careful and keep it well stirred while over the fire or heating. Another way to make extra jelly is by taking a portion of the water the feet are cooked in before letting on the cold water and boil it until it is thick. Keep this in your cooling room and use it instead of cooking the other too much, as too much cooking makes it look mushy and not presentable. If you find it too thin, instead of over cooking add more boneless feet until you get it right, stir well, bring to the boil and it is ready for the crock. Fill the crocks very full as it will shrink; the gallon crock when full holds 8 lbs. net of feet. After standing over night the meat will be firm in the morning. Turn a crock of the meat out to see if it is solid and looks well, cut it in pieces and see that it is all right; you can put these pieces in the next batch, cook it over and it will not hurt it. If you find the meat all right, cover with a dusting of white pepper and lay a piece of heavy dry paper over the pepper; take a piece of heavy manila paper, cut it round, about one inch too large for the crock, soak well on both sides with common flour paste, press it on edge of jar smoothly all around and let it stand and dry. If you want it fancy, buy thin tin foil and paste over the paper; when dry, paste on your label and it is ready for market. Vinegar.—The best vinegar for this use is pure white wine vinegar. In summer it should be forty-five grains, and in winter forty grains. If the vinegar is impure it will darken the goods and make them slimy; if pure it will whiten the goods and have a tendency to make them hard. Care should be taken to put clear, clean, limpid vinegar on vour goods, or you can not turn out good goods. It is the most economical to buy ninety or one hundred-grain vinegar and reduce it as you need it. You should have a proper vinegar tester so you will not be deceived in the strength.